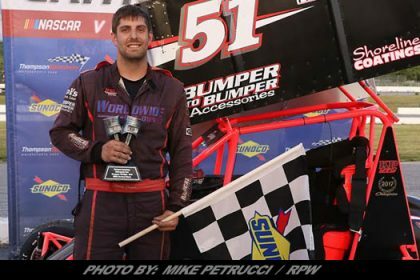 Story By: DAVE BUCHANAN / LANCASTER SPEEDWAY – LANCASTER, NY – Chuck Hossfeld of Ransomville, N.Y. held off hard-charging Mike Leaty to win the fourth annual Ol’ Boy Cup 60 Bill Colton Memorial presented by Thermal Foams on Thursday night at Lancaster National Speedway. Leaty made a last lap challenge on Hossfeld, but came up just a few feet short as Hossfeld won by .019 seconds. In X-Press Signs Stock Car Series Action, Joe Mancuso of Buffalo won the 30-lap Race of Champions Super Stock feature. Andy Cryan of Buffalo was victorious in the Advance Auto Parts Street Stock for the fourth race in a row. In the Roaming Buffalo 4-Cylinders, Jason Anasiewicz of Alden, N.Y. scored his first feature win of the season. 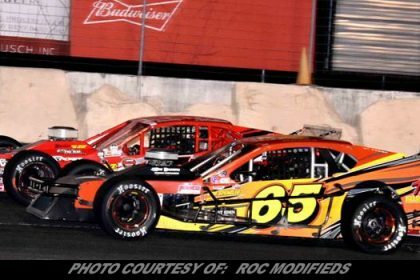 Hossfeld showed plenty of speed right off the trailer as he topped Race of Champions Modified Series qualifying with a quick lap of 16.932 seconds. He went on to win his heat race and then drew second for his starting position in the 60-lap main event. Daryl Lewis, Jr. drew one better than Hossfeld and started on the pole for the fourth edition of the Ol’ Boy Cup 60. Eric Beers and Kevin Miller started the race in the second row. Lewis took off with the lead at the drop of the green flag followed by Hossfeld, Beers and Patrick Emerling. That foursome pulled away from the field during the first third of the race. Mike Leaty was just as fast Hossfeld to start the night, but his luck wasn’t as good. Leaty was second fastest in qualifying and he also won his heat race. His luck ran out during the redraw and had to start 11th for the feature. The short distance of the race forced him to move to the front quickly. It took Leaty 14 laps to work his way up to fifth place. 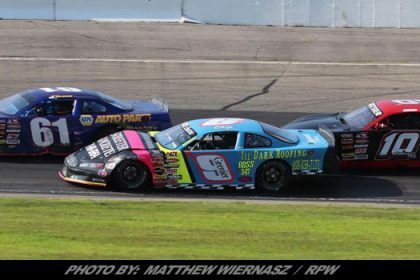 From there his luck started to change as the caution flag waved for the first time on lap 20 when Tommy Catalano stopped on the track with a mechanical issue. This bunched the field back up and gave Leaty a chance to challenge the leaders. The restart also benefitted Hossfeld as he took the lead from Lewis when the race resumed. Two more cautions just past the halfway portion of the race allowed Leaty to move his way through the top five. Leaty took over second from Lewis with 25 laps to go. The race came down to a battle between Hossfeld and Leaty. Leaty chased “The Hot Shoe” and appeared to have the faster car in the closing laps. Leaty had two potential bids for the lead come up short. The first saw Leaty make contact with Hossfeld in turn one, and it forced him to save the car from spinning out. He regrouped and made another attempt with less than 10 laps to go, but the car pushed up the race track in turn two. Lapped traffic and a last lap attempt decided the race. Leaty pulled the outside of Hossfeld in turn three on the final lap with a trio of lappers just ahead. Hossfeld and Leaty raced side-by-side to the checkered flag with Hossfeld crossing the finish line first by about a half of a car length. For Hossfeld it gave him his second-straight win at Lancaster after winning the Joe Reilly Sportsman Summer Slam on June 16. It was his tenth career Race of Champions Modified Series win at Lancaster, and his first RoC Series win since July 2016. Leaty took the defeat in stride and was happy with a second place run for his best finish of the year. 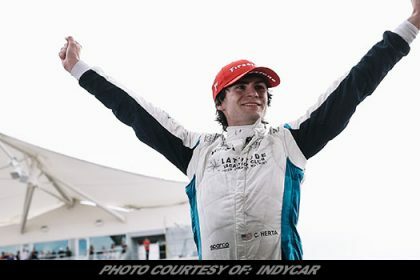 Lewis finished third for his second-straight top three finish at Lancaster. Patrick Emerling and Daren Scherer rounded out the top five. 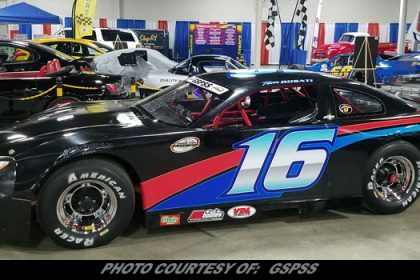 Joe Mancuso took his first Race of Champions Super Stock win of the season on Thursday night. 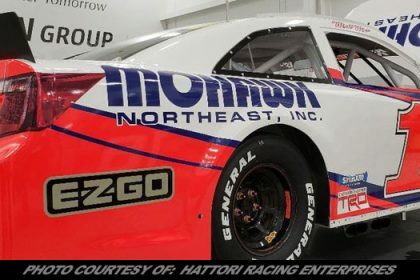 Mancuso passed Chuck Anderson for the lead on lap eight, and then survived a series of late-race restarts to earn the victory. Tommy Barron finished second. Tim Gullo bounced back from an early race spin on the backstretch to finish third. Tommy Reese and Anderson completed the top five. Andy Cryan continued his win streak in the Advance Auto Parts Street Stocks. Cryan passed Ken Maltby for the lead on lap seven, and he then drove away for the final 18 laps for his fourth win in a row. Maltby placed his second for his best run of 2018. Kyle Sharpe finished third in his first race of the season. 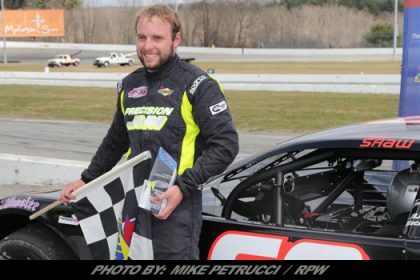 In the Roaming Buffalo 4-Cylinders, Jason Anasiewicz held Kevin Bainbridge at bay for the duration of the 25-lap feature for his first win of the season. The race ran cleanly and without any yellow flags with Anasiewicz playing defense most of the way. Chris Pennell, Dan Dressel and Dave Brunka recorded top five finishes. Lancaster’s X-Press Signs Stock Car Series is back in action on Saturday, July 7 for First Responders Night. Any firemen, police personnel or EMTs and can get in for just $5. 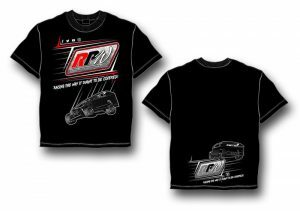 The NYPA TQ Midgets join Lancaster’s three weekly home track divisions. 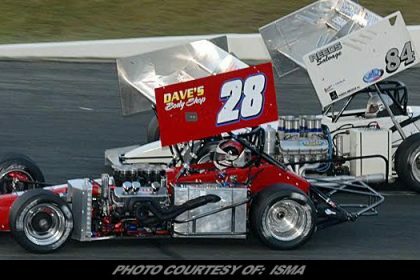 About Lancaster National Speedway & Dragway: Founded in 1959, Lancaster National Speedway and Dragway, WNY’s Premier Motorsports and Event Facility, is a multi-use facility located on 77 acres just outside of metropolitan Buffalo, N.Y. The facility features a 1/8-mile drag strip, a 1/2-mile oval track and hosts several non-motorsports events such as car shows and concerts. 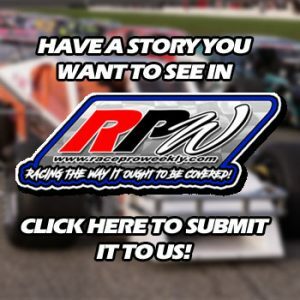 For the latest information on Lancaster National Speedway & Dragway check out our website www.lancasternationalspeedway.com. Additional information for racers and fans can be found on our Facebook page (www.facebook.com/LancasterSpeedway) and on Twitter (@LancasterSpdwy).